The denial of a key permit by the State of Washington has left the largest proposed coal facility on the West Coast of North America high and dry. The proponents of the export terminal in Longview, Washington failed to obtain an aquatic lands sublease permit, dealing a major blow to an industry already struggling to transport U.S. thermal coal to markets in Asia. The public lands commissioner who denied the permit cited the company’s inability to provide a coherent financial plan or a record of their current financial status. The questions considered by the Department of Natural Resources were: Who will clean up the mess made by this massive coal port? And who would pay for it? One major partner, Arch coal, had already dropped out of the project after declaring bankruptcy last January. Meanwhile, global prices for coal appear to largely rise and fall at the whim of the Chinese government, which can turn production on and off in response to domestic political pressure. Last year, weak global prices had U.S. coal companies exporting thermal coal through B.C. at a loss. This was exacerbated by a supply glut as coal exporters angled to get their product to market before it was no longer economically and environmentally feasible. But with Trump taking office, the industry is praying for a turnaround. The Washington decision isn’t much help in B.C., where environmental assessments are notoriously toothless, though it does help highlight the shaky economics behind these pesky coal expansion projects. Noting the opportunities to export this American product through American ports are withering like lungs breathing in coal dust, companies turn their attention to their friendly northern neighbours. This would increase the pressure to send U.S. thermal coal through B.C.’s existing and proposed ports. Couple this inkling with the about-to-be-inaugurated, coal-loving president elect who vows to revitalize this grubby industry and where do we arrive? Well, I’m not much of a betting person, but my inner skeptic prompts me to believe, or at least prepare for, hypothesis number 2. 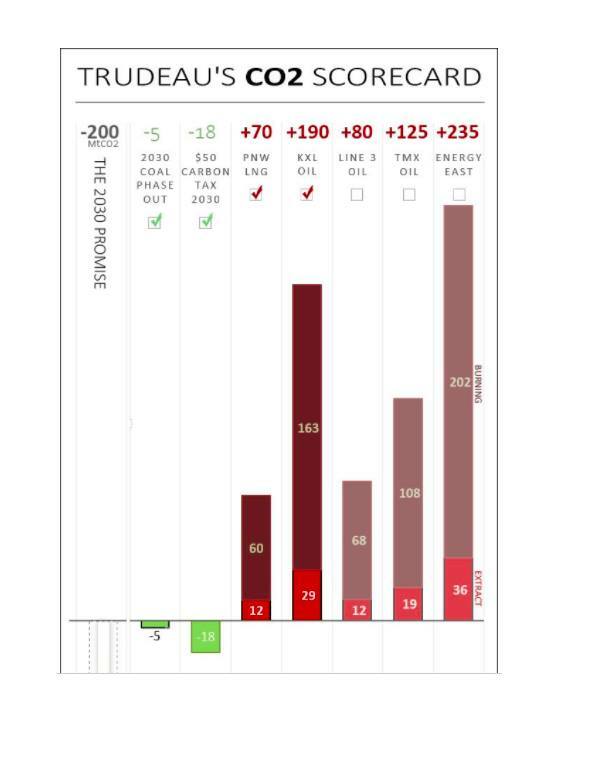 It’s also worth asking where Canada’s thermal coal will go after power producers phase it out under the Trudeau Liberals’ national climate plan. As the chart below illustrates, the coal phaseout won’t bring much relief to the climate, but it could add to the pressure on B.C. ports as everybody fights to get their product to China. Christy Clark says she wants to get China off coal as a means of energy production, calling it a moral obligation. Regardless of what you make of the LNG she hopes to export in its place, most people can agree that simultaneously increasing exports of U.S. thermal coal to China through our province is hypocritical at best. If the premier would like to be perceived as a climate leader, she can’t keep expanding the export of thermal coal. Yet the Fraser Surrey Docks’ coal proposal is still on the table, kept alive in part by a provincial government that seems more interested in collecting cheques from foreign coal companies than protecting the health of British Columbians. U.S. thermal coal even gets a free ride through our province, since rail shipments over the border are not subject to the carbon tax paid by B.C. coal producers. With the stroke of a pen, the next Premier could remove this subsidy and generate revenue by charging out-of-province coal producers a levy equal to their share of the B.C. carbon tax. That alone might squeeze out marginal players like the broke, desperate companies behind the Longview mega-terminal proposal — which would be good for people’s lungs and the global climate. Is it time to ramp up Communities and Coal and No Coal Surrey/White Rock to fight this battle again? Yes, I’d say perhaps it is time to revive that spirited opposition. And of course, we have the court date coming up which will be critical in stopping this project. But we need to be sure that politicians and proponents know that we still won’t allow more US coal to be shipped through our ports, a product that threatens our communities and our health. Yes indeed, we have plans to stop this project! Our local teams are working to make sure this project never moves forward. There are many ways by which we are working to stop this project, but one of the best ways is to organize with a local Dogwood team! Currently we are meeting with our candidates in the upcoming provincial election and making sure they know we don’t want them to support exporting US coal through our province. There are also lawsuits ongoing to revoke the permits needed for the Fraser Surrey Docks project to be built. Thank you for getting in touch! I want a public inquiry and financial compensation into my file declared top secret by SIRC the watchdog for CSIS in 1989 when I spoke to the government of Canada. I want justice. How many times must you the Government be told that things are going pear shaped? On the world stage Canada is not much more than a feed bag for other countries. As much as I detest, Trump, he seems to want more products made in the States while I say the same about Canada. It’s about time we started using our brains and talent to do whatever in Canada. We (you the government) seem to be so anxious to export pollution from here to other countries so we aren’t the polluter. It’s a shame and disappointment that things didn’t get better when the Liberals got in power. Shame on you, don’t give us away; Canada belongs to me and some others. The Canada Marine Act, which allows our port authorities to exist, require the port authorities to operate to the benefit of the Canadian economy. Exporting US coal through a Canadian port, which are subsidized by the Canadian economy puts our Canadian coal exports at a loss. The Vancouver Fraser Port Authority knows this but they are frozen in fear about admitting it. There is no mention in this article of the Massey Tunnel Replacement Project. Apart from this being yet another huge profit generator for the corporate friends of and donors to the BC Liberals, the main true reason for this plan is to provide access for larger ships, especially coal carriers, to the Fraser-Surrey Docks after removal of the existing Massey Tunnel, to the benefit of the Vancouver Port Authority who will contribute nothing towards it. Adding increased traffic capacity across the Lower Arm could be done easier and cheaper by adding an extra tunnel. There will also be crossing tolls applied that will almost certainly be higher than than the $3.50 charge on the Port Mann bridge, estimated to possibly add up to $1000 per year for commuters living south of the Fraser. The Massey Tunnel Replacement Project is going to swallow up 2401 hectares of environmentally sensitive and valuable land. That’s 24 sq km or 9 1/4 sq miles, for no compelling reason except to facilitate shipping American coal.